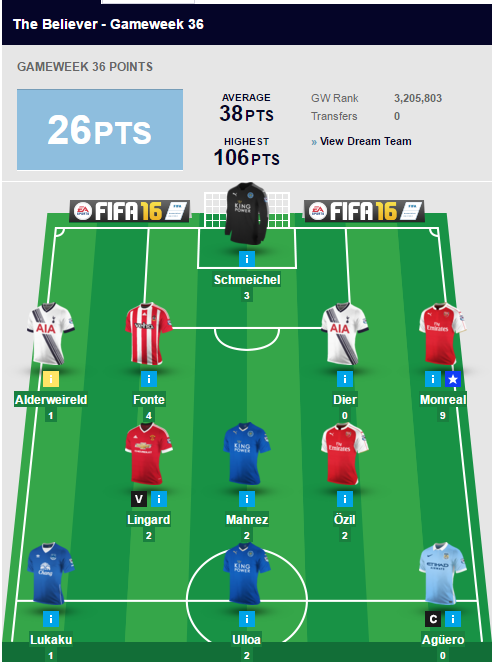 Unless you’ve been on Mars this Bank Holiday weekend, you’ll surely know that Leicester are officially Premier League champions, but while it’s all over in real life, the battle is raging on in Fantasy Football. It wasn’t an easy weekend for Fantasy gaffers, with the Foxes heading to Manchester United, and Tottenham facing Chelsea at Stamford Bridge. Throw in numerous personnel changes by Manuel Pellegrini and Jurgen Klopp at Man City and Liverpool respectively, and this was a gameweek fraught with dilemmas. But the Ladbrokes Life gang came out of the carnage rather well, with Mr Brightside holding on to the bragging rights with 50 points. He holds a 41-point lead over Generous John who claimed 49, but it was the Gut Truster who top-scored for the crew this weekend, despite captain Sergio Aguero not featuring. 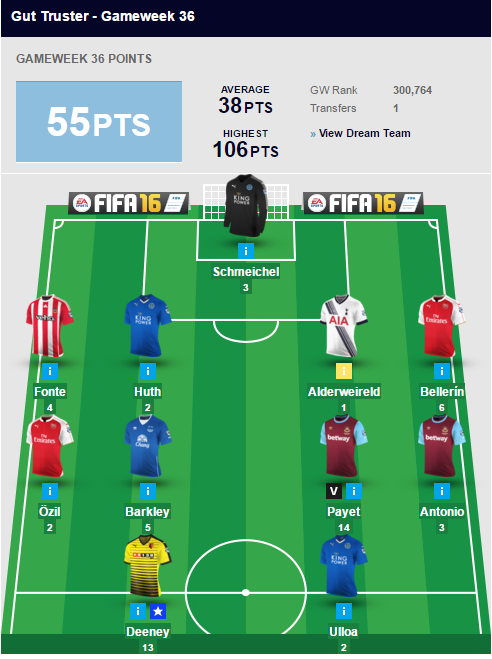 A solid 55 from the man who believes in anything but logic, saw him move to just 23 points behind Generous John. Barring miracles, The Professor is out of the running, despite his 50 point haul this weekend, while the season-end can’t come soon enough for The Believer. A paltry 26-point return has led many to draw comparisons between his side and Aston Villa. But back at at the top of the Ladbrokes Life League, just nine points split the top four and three points cover the leading trio after a poor weekend for league-leading Brendan Cunningham and his ‘Who Got the Assist?’ outfit. With only two gameweeks to go, where will that £100 Free Bet be heading? Are you in the Ladbrokes Life League? Let us know how you’re getting on this season via @Ladbrokes!